This recipe was included in my Redbook Houseparty thanks to Houseparty.com. The party pack included tons of free makeup. It also came with a coupon for a free Hellmann's Mayo with Olive Oil. I wasn't sure how this dish would turn out considering Mayo was an ingredient, but I was actually impressed and enjoyed the meal! The recipe can be found here. This would make an excellent appetizer or main entree. In a medium sized bowl combine the mayo and cheese. Evenly top the chicken with the mayo mixture, then sprinkle with the breadcrumbs and Italian seasoning. Bake the chicken for 20 minutes, or until it reaches 165 degrees. While the chicken is cooking combine the remaining ingredients in a bowl. 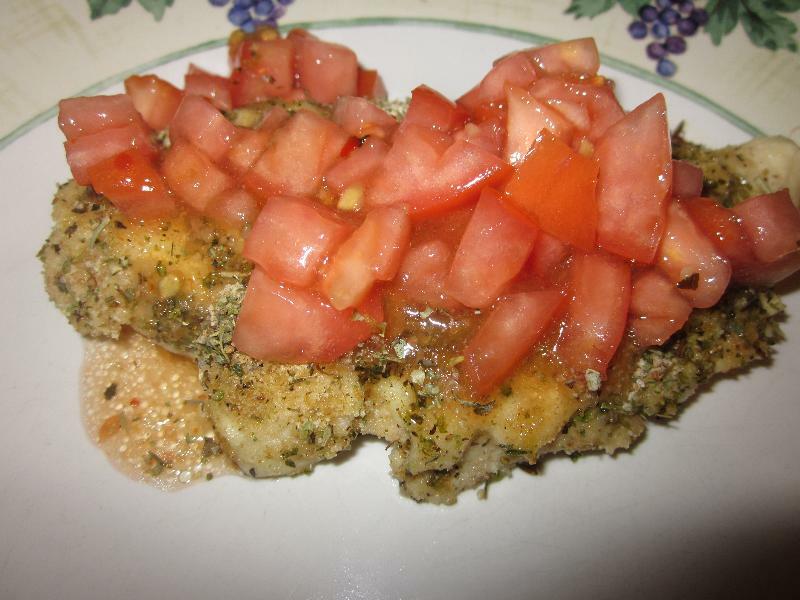 Serve the chicken topped with the bruschetta mixture.